Impress your clients with dashboards that are custom-made for them and perfectly adapted to your agency’s needs. Your marketing agency will have an edge over the competition the second your clients see their awesome digital marketing dashboard. DashThis gives you an all-in-one agency marketing dashboard that lets you easily manage all your data, for each of your clients. Easy to create, exciting to receive! Simplify your life with an easy-to-use dashboard. With DashThis, it’s as easy as 1-2-3 to incorporate all your integrations, manage your data, and create new dashboards. You can even clone your dashboards for each and every client, and create new dashboards instantly with preset templates. Customize everything from the logo, the layout, to the metrics. Add sections, graphs, comments, or images and configure your dashboard’s layout easily with a simple drag-and-drop. With our white label options, you can also customize your dashboards using the colours and branding of each individual client, or your own! Share your dashboards easily by adding all of your agency’s employees to the account. Manage your team’s work by sharing one dashboard or a group of dashboards and give access as needed for each colleague. Your client need their dashboard fast? Share the dashboard’s URL automatically so that they have access to their dashboard on demand, 24/7. Your agency’s dashboard probably includes data from Google Analytics, Facebook Ads, AdWords, Google Search Console, and more! DashThis supports all the major marketing tools you use to track your clients’ data. And if your clients have their own custom data you can import your own CSV files and create a new custom dashboard with literally all the data you need. Not only that, but your clients will have access to their data 24/7 with our live dashboards. Don’t just take our word for it; thousands of other agency clients trust us with their dashboards and have spread the DashThis love all over the Internet. You, too, can be just as happy with your dashboard creation process! Everything about our tool has been thought-out to ensure you get all the features your agency needs, in a user-friendly environment that you can navigate through painlessly without any help from your IT specialist. Sounds too good to be true? It’s not! Find a pricing plan that fits your needs. Here at DashThis, you only pay for the number of client dashboards you use. Plus, every pricing plan includes your very own awesome account manager and much, much happiness. Replace the standard DashThis dashboard URL with one branded to your agency (dashboard.youragency.com maybe?). Let us create custom dashboards for you with a white label design that reflects your agency’s colours, fonts, and overall vibe. Save on a custom URL and design with a white label bundle that includes both! 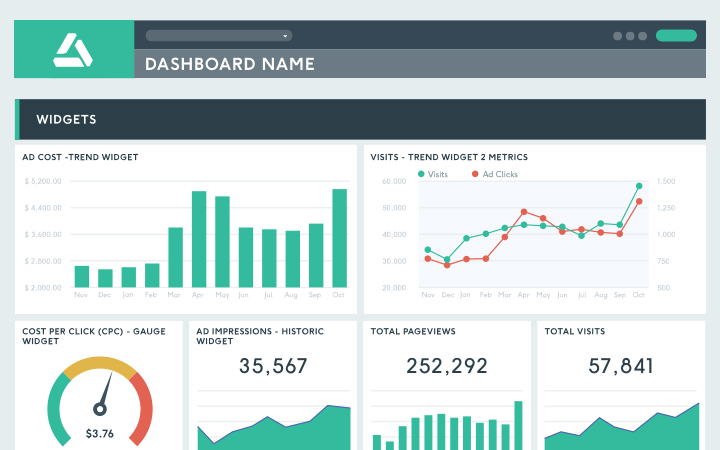 An agency dashboard just the way you want! Our blog is always a great place to find tips of the trade to impress your clients as well as information on our product and updates. You can also sign up for our newsletter to get the latest info!